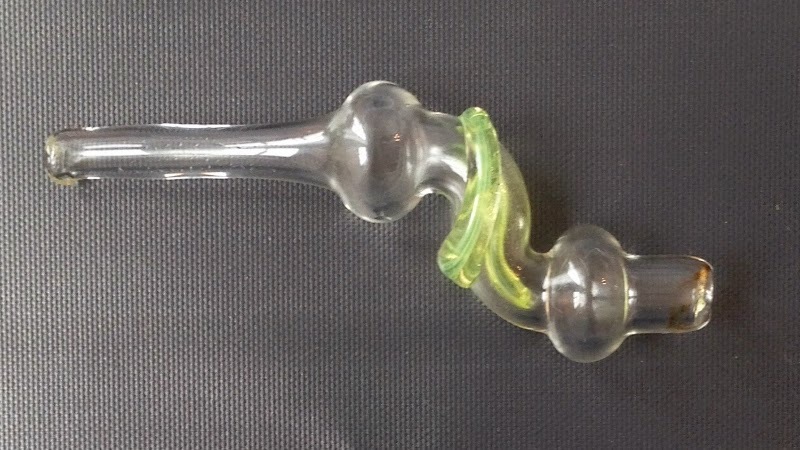 The QuickStiQ is a nifty glass pipe design that simplifies the 'dabbing' process. Any number of cannabis extracts can be vaporized using the QuickStiQ - BHO, shatter, wax and even traditional hash. As a connoisseur of cannabis in its many guises, I am a fan of well prepared extracts and the increasingly intricate devices used to enjoy them. But doing 'dabs' of hash oil - with the requisite glassware, blowtorch, 'nail' and dab-stick, is so complicated it can detract from the relaxation of the hash experience. 'Dabs' are tiny amounts of highly concentrated cannabis extract which are vaporized (not burned). The active ingredients are turned into a vapor which is inhaled and enjoyed - all without burning anything. Nothing is burned - so nothing is smoked - which is why 'dabbing' can occur indoors, at dispensaries and such, while outright smoking is generally prohibited. The QuickStiQ is heated with a butane cigar lighter (or small blow torch) for about 5 seconds until hot. The glowing hot end of the QuickStiQ is then dabbed into the heat-proof Oil Slick container holding the cannabis extract. This is done quickly and gently - and the resulting vapor/smoke is inhaled through the mouth-end of the QuickStiQ. The double bubble s-trap design protects against melted extract migrating into the mouth of the unsuspecting consumer. The Oil Slick container is made with medical grade silicone that will not stick to the ooey-gooey gunky texture of even the stickiest hash oil extracts. Learning the correct timing and technique of heating the end of the QuickStiQ took a little practice - and getting the temperature correct is vital for a consistent experience with extracts. The end result of this was that the same extract could taste floral and inhale smoothly at one temperature and be generally disagreeable at other temperatures (see note below). A few dabs of the BHO extracts we sampled with the QuickStiQ were sufficiently potent for even the most medicated members of our tasting group. Smoking high quality marijuana is like drinking beer or wine - but doing dabs is more like doing shots. With up to 3x the concentration of active ingredients, these hash oil extracts pack a punch. The glassware and especially the required blowtorch style lighter was off-putting to some members of our tasting group who likened the whole experience to smoking crack cocaine. Others disagreed, and pointed to the decorative colored designs on the side of the QuickStiQ. Regardless of whether you are using a vape pen, a traditional dab set-up with nail, a vaporizer like the Volcano (R) or a QuickStiQ - the temperature of whatever is vaporizing the cannabis extract is of vital importance. Temperature will impact not only flavor and smoking quality (ie - harshness) but will impact the subjective quality of the 'high' by changing the chemistry of some of the numerous cannabinoid compounds in the cannabis extract. THC vaporization temperature: ~ 365 degrees F (185 C). Overall, the QuickStiQ is an innovative way to enjoy the increasingly broad array of cannabis extracts with minimal investment, good portability and functionality. Hash Oil Rigs can cost hundreds and even thousands of dollars. This well designed product delivers an experience similar to far more complex (and expensive) systems. The downside of the QuickStiQ is, well, the blowtorch. But as dabbing has gained popularity, an array of specialty style blow-torch lighters are widely available. The QuickStiQ is available in a variety of colors from the Peoplez Champz booth at the Galaxy NW Cannabis Market. Note that NWCM is a medical marijuana access point that requires all visitors to be current Washington State Authorized Medical Marijuana patients.